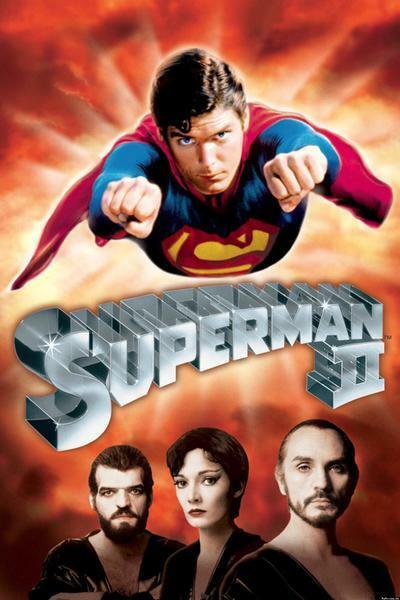 "Superman II" begins in midstream, and never looks back (aside from a brief recap of the first movie). In many ways, it's a repeat of the last ninety minutes of the first film. It has the same key characters, including archvillain Lex Luthor. It continues the love story of Lois Lane and Superman, not to mention the strange relationship of Lois and Clark Kent. It features the return of three villains from Krypton, who when last seen were trapped in a one-dimensional plane of light and cast adrift in space. And it continues those remarkable special effects. From his earliest days in a comic book, Superman always has been an urban hero. He lived in a universe that was defined by screaming banner headlines and vast symbolic acts, and Superman II catches that flavor perfectly with its use of famous landmarks like the Eiffel Tower, the Empire State Building, Niagara Falls, and the Coca-Cola sign in Times Square. He was a pop hero in a pop world, and like Mickey Mouse and the original Coke trademark, he became an instantly recognizable trademark. That's why the special effects in both Superman movies are so crucial. It is a great deal simpler to show a rocket ship against the backdrop of outer space than to show Kryptonian villains hurling a city bus through the air in midtown Manhattan. But the feeling of actuality makes Superman's exploits more fun. It brings the fantastic into our everyday lives; it delights in showing us the reaction of the man on the street to Superman's latest stunt. In the movie, as in the comic book, ordinary citizens seem to spend their days glued to the sidewalk, gazing skyward, and shouting things like "Superman is dead!" or "Superman has saved the world!" In "Superman II" he saves large portions of the world, all right, but what he preserves most of all is the element of humanity within him. The Superman movies made a basic decision to give Superman and his alter ego, Clark Kent, more human feelings than the character originally possessed. So "Superman II" has a lot of fun developing his odd dual relationship with Lois Lane. At long, long last, Lois and Superman make love in this movie (after champagne, but discreetly offscreen in Superman's ice palace). But Lois and Clark Kent also spend the night together in highly compromised circumstances, in a Niagara Falls honeymoon haven. And the movie has fun with another one of those ultimate tests that Lois was always throwing at Clark to make him admit he was really Superman. Lois bets her life on it this time, hurling herself into the rapids below Niagara Falls. Either Clark can turn into Superman and save her -- or she'll drown. And what then? All I can say is, Clark does not turn into Superman. This scene has a lot of humor in it, and the whole film has more smiles and laughs than the first one. Maybe that's because of a change in directors. Richard Donner, who made the first "Superman" film and did a brilliant job of establishing a basic look for the series, was followed this time by Richard Lester ("A Hard Day's Night," "The Three Musketeers"), and this is some of Lester's best work. He permits satire to make its way into the film more easily. He has a lot of fun with Gene Hackman, as the still-scheming, thin-skinned, egomaniacal Lex Luthor. And he draws out Christopher Reeve, whose performance in the title role is sly, knowing, and yet still appropriately square. This movie's most intriguing insight is that Superman's disguise as Clark Kent isn't a matter of looks as much as of mental attitude: Clark is disguised not by his glasses but by his ordinariness. Beneath his meek exterior, of course, is concealed a superhero. And, the movie subtly hints, isn't that the case with us all?